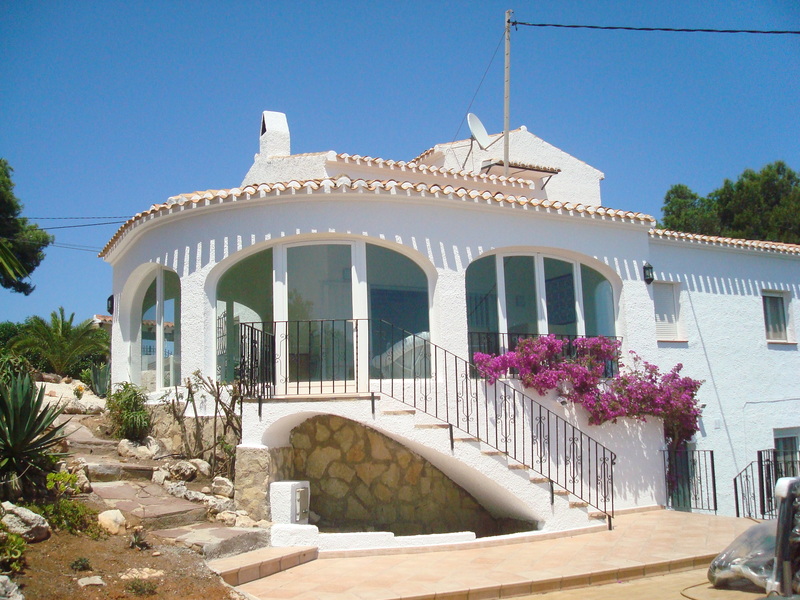 Superb 4 bed villa sleeps 8 with private pool and stunning panoramic sea views. Tranquil and very private location in the exclusive Costa Nova area perfect for relaxation. Secluded large south-facing private sun terrace with a sun lounger for everyone + gas BBQ. Well-fenced secure, mature gardens and situated on a large plot giving a lovely sense of space around you. Pool fence to protect non-swimmers, perfect if you have very young children. Only a short drive to Javea’s sandy beach, its historic old town and fishing port. 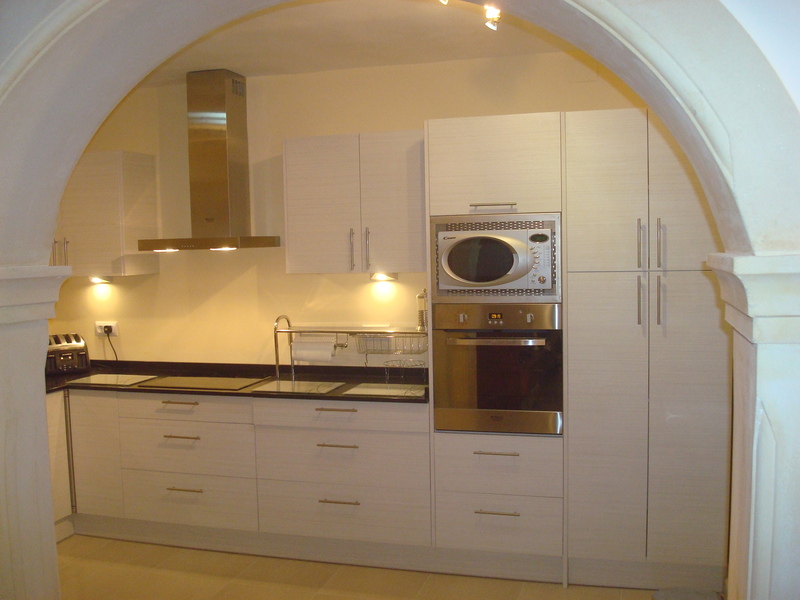 Restaurants, bars and tennis courts within walking distance. We have WIFI so you can keep in touch with the outside world when/if you need/want to! Air-con is included in the price except for mid-September to end of May when it is simply not needed (but is available as an optional extra). Satellite TV, DVD with over 50 movies and PlayStation 2 console with over 50 games to keep the kids occupied and happy…as well as the Cinderella castle! 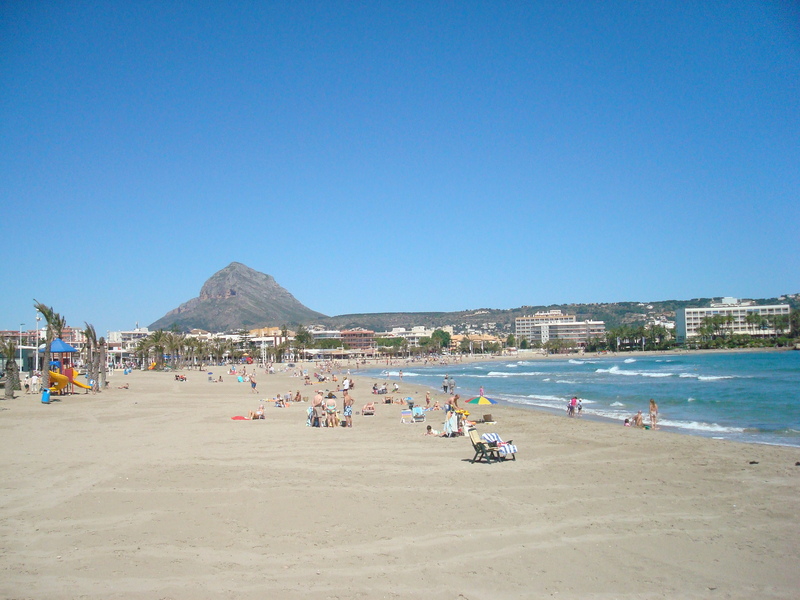 Also nearby are many other lovely tourist resorts such as Altea, Calpe, Moraira, Denia & Benidorm. IS THIS THE PERFECT VILLA? The only thing we can’t guarantee is the weather but even if that isn’t perfect you won’t be stuck in a cramped hotel room. 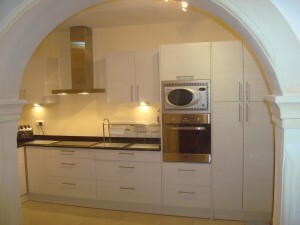 Instead you will be in a lovely comfortable and relaxing home with satellite UKTV, DVDs, books and PlayStation 2 games. Alternatively just relax and curl up with a good book and relax. There are plenty of outstanding restaurants and bars in the area as well as a large shopping mall to keep you entertained. Come stay with us and you will find you can relax and recharge your batteries in a quiet and comfortable setting yet just minutes away you have all the activities and amenities that you could ever wish for! Javea itself is just such a fantastic place for a holiday, a lush, green mountainous area full of coves, cliffs and beautiful sandy beaches. Javea has something for everyone with three distinct and separate areas: the historic old town, the traditional Spanish fishing village port area and the international tourist beach area full of a variety of bars and restaurants. 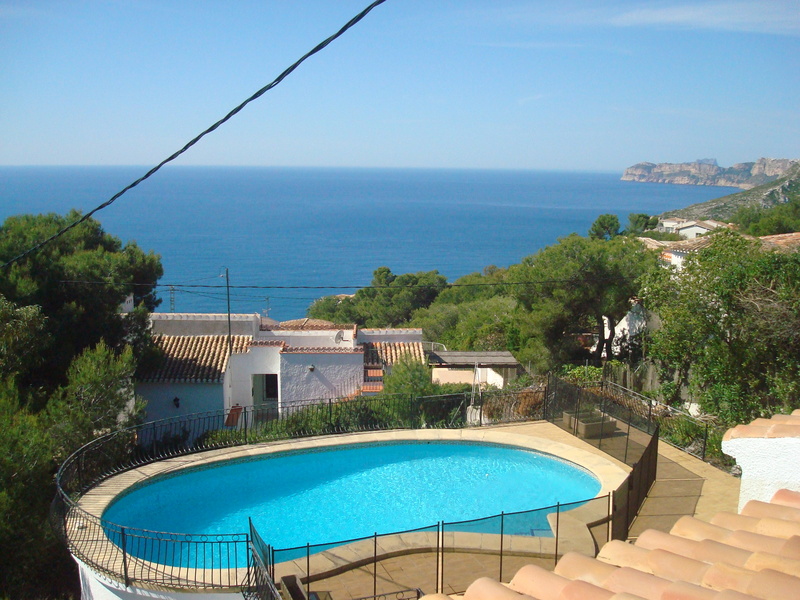 Principally the main draw of Javea is the crecent-shaped sheltered bay with the wide sandy beach. The waters are ever so shallow and safe for children. The promenade lining the beach is pedestrianised so you and your children can safely wander in front of the beach and choose from the incredible variety of bars and restaurants serving all kinds of different types of foods. On our Javea page we tell you more about why we love Javea. The surrounding area is also ideal for excursions. 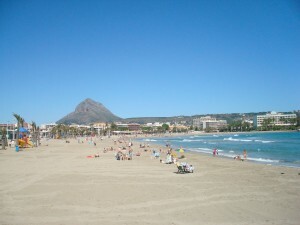 This region is known as the northern Costa Blanca and we have more detail on our Location page. A very green mountainous region it is known as the White Coast due to the very bright and clear light in contrast to the blue skies. The sandy beaches are amongst the best in Spain. The area has major tourist towns and cities such as Alicante and Benidorm but mostly it is renowned for it’s small fishing villages which are now invariably tourist resorts due the very high quality of beaches. In contrast, go inland to the mountains and valleys full of vineyards and enjoy a taste of the traditional Spanish way of life. 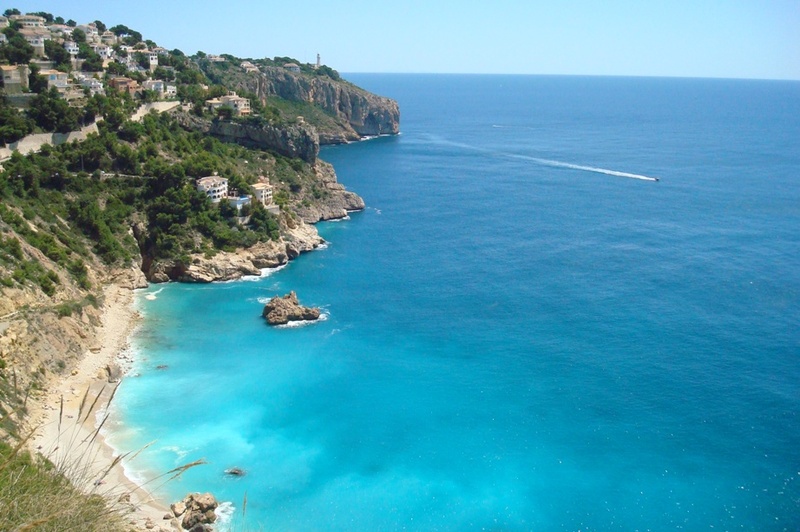 We recommend excursions to Denia where you can catch a ferry to Ibiza, Calpe for the famous landmark Calpe rock and fish market, Moraira for El Portet beach with it’s Caribbean-like waters and Benidorm for nightlife and the five theme parks. 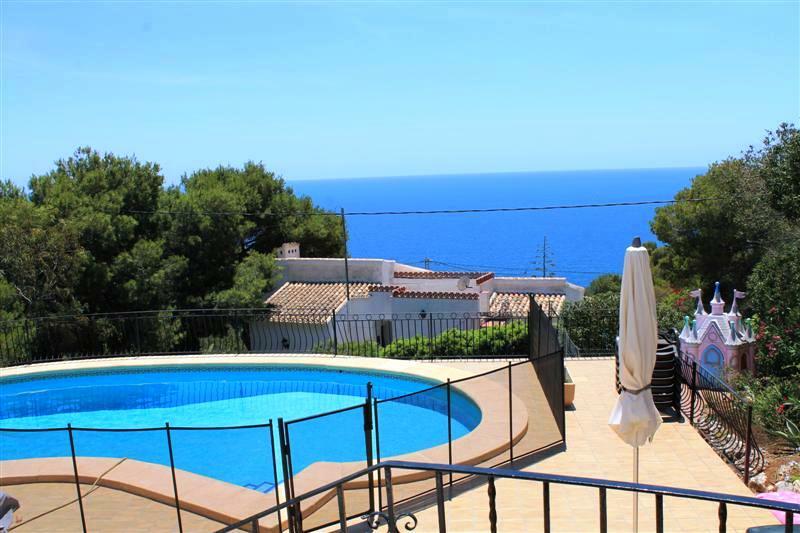 The villa is just minutes away from the hustle and bustle of the busy beach area of Javea but it could be in a different world really. Set in a prestigious residential area known as Costa Nova the villa is an oasis of calm and tranquility. Indeed many guests hardly leave the villa during their stay! The heart of the villa is the south-facing naya/conservatory which has magnificent sea views and overlooks the pool and terrace so you can check on the kids. If they ever come out the pool it will probably be to play on the terrace with the Cinderella castle! 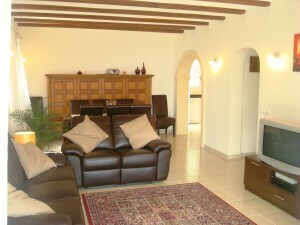 The villa is modern and comfortable and guests have told us we are not stressing enough just how private the villa is. With the large grounds it certainly has a calming sense of space. When people walk in and see the views they say it just has a warm, welcoming feel to it. Our pictures tell their own story and to see more you can view our Inside the Villa page packed with more details and plenty of photos. The front of the house is where you will probably send much of your holiday. Steps lead down from the naya/conservatory to the large terrace and large 10 x 5 metre swimming pool. We have plenty of chairs and sunloungers (4 have special face shades). You could start the day with breakfast on the terrace. We have a large dining table and plenty of shade from two large parasols. South-facing we enjoy the sun all day. Later you could watch the sun go down with a refreshing drink and maybe this is a perfect time to light the gas BBQ. Our many pictures tell their own story and to see more on our Outside the Villa page packed with more information and photos. “My friends and I all agree this was our best holiday by far. We were a little worried about finding the villa, but the information pack we received from Mark was very detailed, we had no problem at all. On arrival Linda was there to greet us and give advice, the villa was immaculate and had everything needed and more. Views were breath taking and it was very peaceful and secluded but not too far from bars and restaurant (best of both worlds) 2 weeks for sure next time we didn’t want to come home. You know you will have a great time with us but don’t just take our word for it – take a look at our Reviews and Guest Comments page where we post real feedback from previous guests. Our aim is to get the same familiar faces back year after year so we do everything we can to make sure you have a fantastic holiday. Certainly there is so much to do and see in the local area that without doubt you could easily come back here time and time again. Staying in a hotel is almost certain to cost you far more whereas staying with us is like having your own home with all the comforts, facilities and privacy on hand. Check out our Prices page to see the great value we offer. BEFORE YOU GET TOO CARRIED AWAY! Unfortunately we only have one villa and at peak times such as July and August we could probably fill the villa 10 times over such is the demand. So we strongly suggest that you check out our Availability page just to make sure that we currently appear to have the space available that you are looking for. It may be that we are already talking to someone else and we might be just waiting for a deposit to arrive but if the calendar is not booked off then there is a good chance we have room for you.